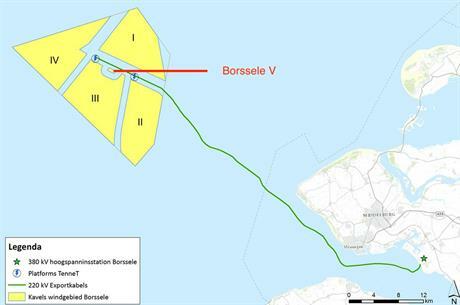 NETHERLANDS: The Dutch government plans to launch a tender for Borssele Wind Farm Site V in January, according to the Netherlands Enterprise Agency (NEA). The NEA's final version of the project site description (PSD) for the site stated the government will issue the call for tender on 2 January 2018. Site V, located beside the 700MW first phase of the main zone, is designated as a two-turbine test site with a minimum total capacity of 6MW and a maximum total capacity of 20MW. The PSD adds that "both the Dutch government and the offshore industry agree that further cost reductions are possible", and commercially viable innovations that might aid this reduction need to be thoroughly tested. The Dutch government aims to cut offshore wind costs by 40% by 2020, compared with 2010 prices. To be successful, submissions must be capable of reducing the price of offshore wind, as well as benefiting the Dutch economy. The total subsidy for the site is capped at €57 million, the available investment grant at €42 million and the available operating grant at €15 million. A stimulation of sustainable energy production (SDE+) operating grant, capped at €54.49/MWh — the winning price for Borssele III/IV — is also up for grabs. The up-to-20MW can be connected to the transmission network, Tennet’s platform beta, the PSD stated. The beta network is already planned for 700MW offshore sites being built at Borssele III and IV. The Borssele zone lies in the North Sea, at the western end of the Dutch Exclusive Economic Zone. MHI Vestas signed a conditional agreement to supply 700MW at Borssele III and IV in March. It is being developed by Shell, Van Oord, Eneco and Mitsubishi/DGE. And is expected to be operational in 2022. In July, Siemens Gamesa Renewable Energy won a 752MW contract for Dong Energy’s projects at Borssele I and II projects, which are due online in 2020. The deadline for tender submissions for the test site will be 5pm local time on 18 January 2018.